After Sarah Decker and Monica Mahal participated in the citywide White-Out Against Bullying event at Watchung Hills Regional High School in New Jersey, they became dedicated to spreading awareness about the issue of bullying. Now in college, Sarah and Monica continue to promote the importance of being an upstander. Upstander. This word needs to become part of of our everyday lives. An upstander is a person who chooses to take positive action in the face of injustice in society or in situations where individuals need assistance. 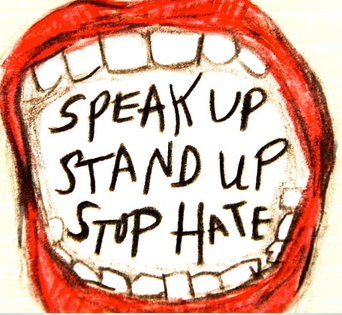 Bullying, hate crimes, and intolerance can be actively prevented in many cases simply by standing up for the victim and using your voice or your actions to stand against injustice. Upstander is not only a crucially important concept, but the word itself represents a movement to end bullying, injustice, and intolerance. But even as we write this entry now, upstander is being underlined in red by our computer spellcheck because it is not an officially defined word. How can we teach the next generation to live as upstanders without this word as a defined member of our vocabulary? Upstander is a word that should fill school cafeterias, street sidewalks, shopping malls, offices and alleyways. It is a word that should stop hate crimes, racism, sexism, intolerance and bullying. It’s a word that every kindergartner should learn to spell and that every neighbor should learn to use. It’s a word that should stand tall against bullies, and offer a helping hand to those in need. This word needs to become part of our everyday lives. So we are petitioning to add this important word to the Oxford English Dictionary. We see these statistics and we ask ourselves why? Why does our society—why do bystanders—allow this to happen? The answer is simple. We don’t have enough upstanders in this world. The first step in reducing these statistics—helping kids feel safe in their own classrooms, and people feel free to express who they are—is to define upstander. Today, will you take this step? Sign our petition at Change.org. Good news. Upstander is officially a new word in the Oxford English Dictionary. From the home page. What's new: More than 500 new words, phrases, and senses have entered the Oxford English Dictionary in our latest update, which sees the inclusion of Brexit, YouTuber, and upstander.